Fisher-Price of East Aurora, N.Y., is recalling about 44,000 Power Wheels Barbie Dream Campers. The ride-on Power Wheels can continue to run after the foot pedal is released, posing an injury hazard. The firm has received 17 reports of the power wheels continuing to run after the foot pedal was released. No injuries have been reported. This recall involves children’s Power Wheels Barbie Dream Campers with model number FRC29 with a grey foot pedal. 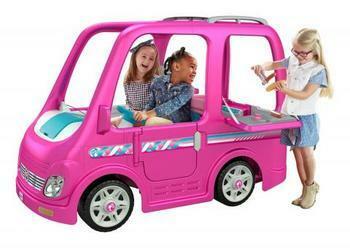 The recalled ride-on vehicles are hot pink with blue accents and have the Barbie logo printed on the back. The campers, manufactured in Mexico, were sold exclusively at Walmart stores nationwide and online at Walmart.com from July 2018, through January 2019, for about $400. Consumers may contact Fisher-Price at (800) 348-0751 from 9 a.m. to 6 p.m. (ET) Monday through Friday or online at www.service.mattel.com and click on “Recalls & Safety Alerts” at the top of the page, or www.fisher-price.com and click on “Recall Notice” at the top of the page for more information.